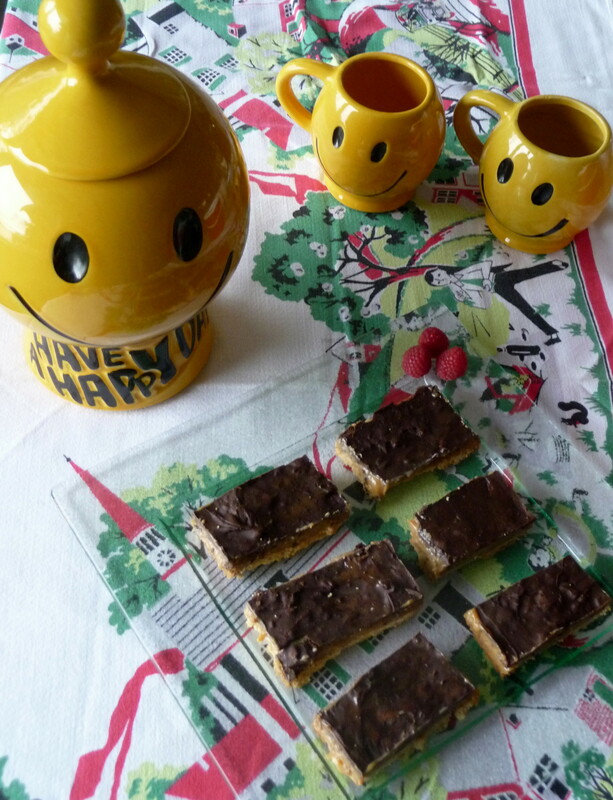 Having sampled millionaire’s shortbread in both England and Scotland, upon our return, I tried a recipe from a free publication I found in Glasgow. Sue Lawrence was a winner of UK’s Master Chef, and I was delighted to come across her version of millionaire’s shortbread. The recipe is easy to prepare, but it does require several hours of inactive time. Plan accordingly. Sue wisely takes advantage of the not-so-secret technique of boiling tins of sweetened condensed milk to create a creamy caramel filling. I had read about this but not tried it previously, so I wondered if it was that easy…yes, it is. However, I had not such good luck with my chocolate melting. I rely on the microwave for very little except for making quesadillas (a skill Martha Stewart herself picked up in the “big house” – or, prison – a few years back in West Virginia) and for melting chocolate. I decided to use milk and semi-sweet chocolate chips for this recipe and not-so-cleverly chose to melt them together in the microwave. The milk chocolate chips took longer and wound up seizing up, so I decided to salvage the 12 ounces of chocolate by making almond bark. 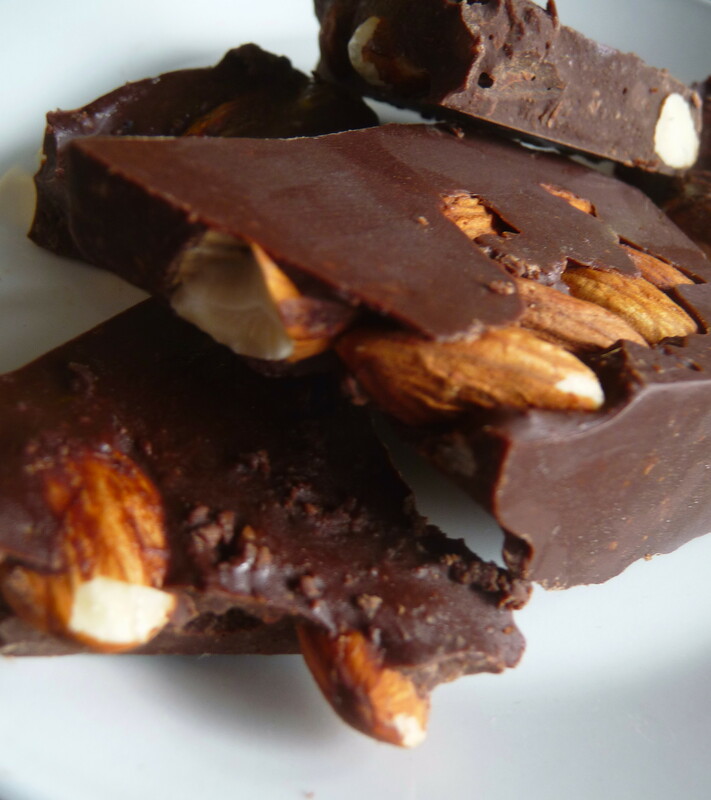 Quickly, I added about ¾ of a cup of almonds to the granular chocolate and pressed the mixture into a baking pan (silicone works well for easy removal), and then I refrigerated the almond bark. Hence, the poor man’s almond bark came about as a by-product of millionaire’s shortbread. Waste not, want not, as every pull-yourself-up-by-the-bootstraps millionaire might tell you. 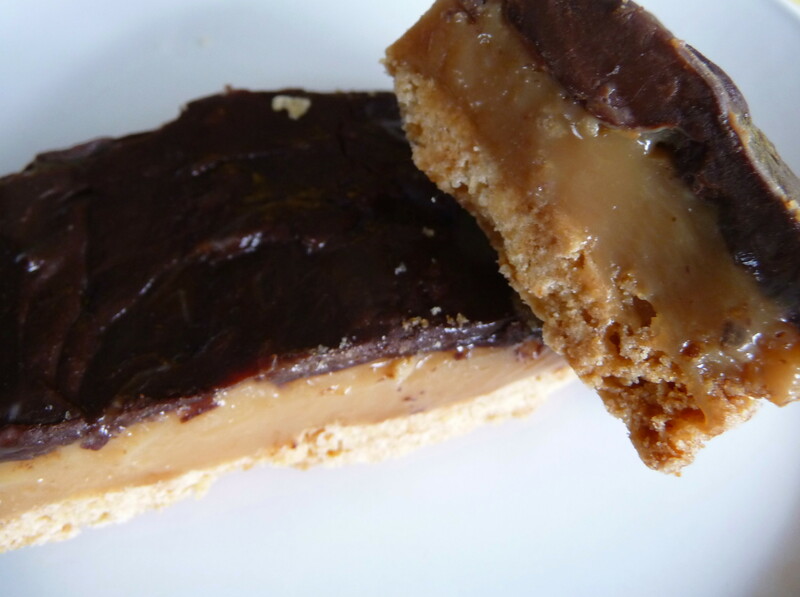 This millionaire’ shortbread resulted in a sturdy crust, with a good crunch, to complement the rich creaminess of the caramel filling and the firm toothsome double-chocolate layer. It is fit for a millionaire or anyone who simply enjoys a triple-threat of treats. 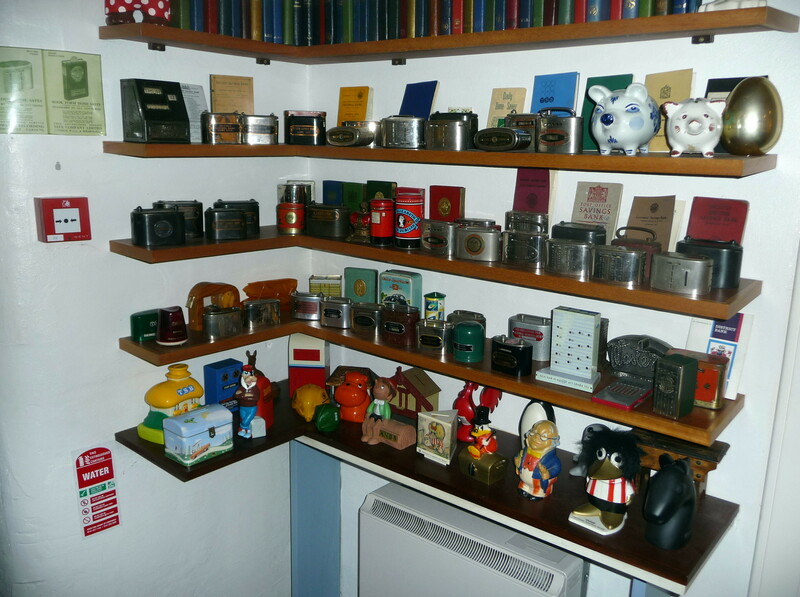 The one-room Savings Bank Museum (Ruthwell, Scotland) extols the virtues of thrift. Add flour, cornmeal, and sugar to the bowl of a food processor, pulsing until combined. Add butter and pulse until combined – the mixture will resemble fine bread crumbs. Butter a 9” x 13” baking pan (non-stick, preferably). Place the shortbread crust mixture into the pan, pressing evenly and pushing down to create a dense layer. Bake for 20-25 minutes until a toasty golden brown colour. 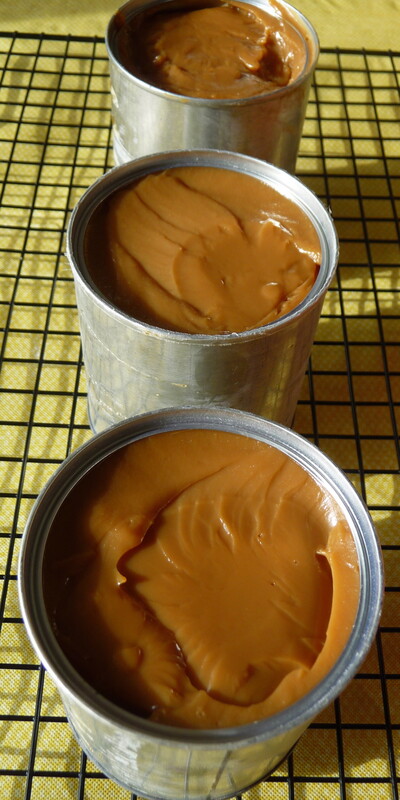 Carefully spread the caramel from 2 and ½ of the tins (or use it all for an extra-thick layer!) over the shortbread. Melt chocolates (separately!) in a microwave oven (two minutes on 75% power, or until almost entirely melted) or use the double-boiler method. Spread chocolate carefully over caramel layer to form an even top-level. May be frozen for several months or refrigerated for up to a week. This entry was posted in Baking, Dessert, Recipes Misc and tagged Caramel, Chocolate, English, Rich, Scottish, Shortbread. Bookmark the permalink. yum! another reason to love the Scots! thanks. I had bookmarked a recipe for this a few months ago. I really, REALLY want to make them, not that I’ve overcome my fear of making caramel. Great save on the chocolate tempering. I just watched Ina Garten’s recent episode on how to temper chocolate and that helped. I’ve seized mine up a few times, too. 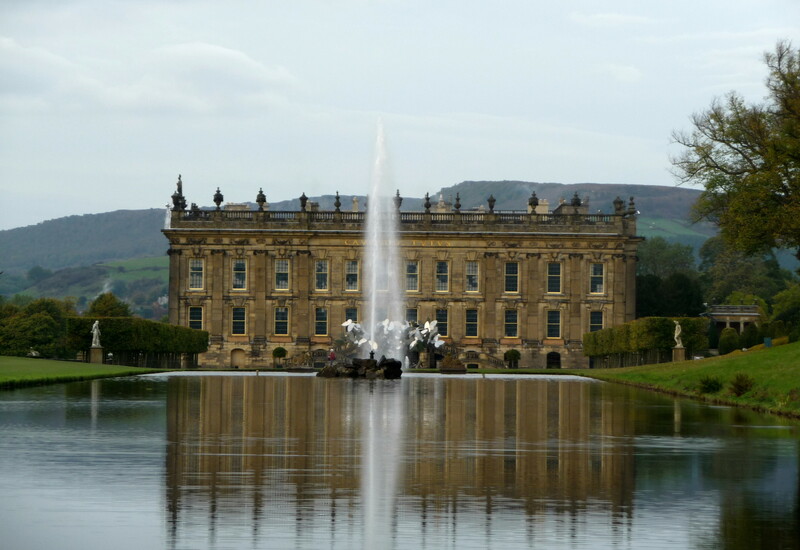 LOVE the photos of the estates in England. 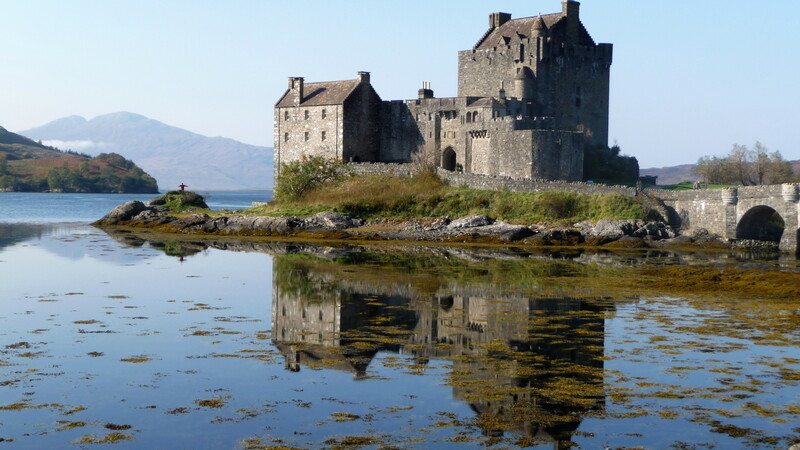 I am a historical fiction addict and have enjoyed several lovely trips to the UK. Lovely! Hi, Deb. Thanks so much for your kind words. I think you’d enjoy the millionaire’s shortbread, given our similar tastes in baked goods (I am still grateful for your chocolate bliss cake recipe!). Last year, I started making my own caramel, which was rather easy, but I’d never tried the caramelized version of sweetened condensed milk, which is easier yet. Looks like you had a nice trip! It’s funny, I’ve always known the millionaire’s shortbread as my mom’s toffee bars–She makes them almost the same way–The shortbread crust, the sweetened condensed milk caramel layer, and she uses semi-sweet chocolate chips for the chocolate layer. She scatters them on the warm caramel & then lets them melt a bit before spreading them over the top. Either way it’s good stuff! 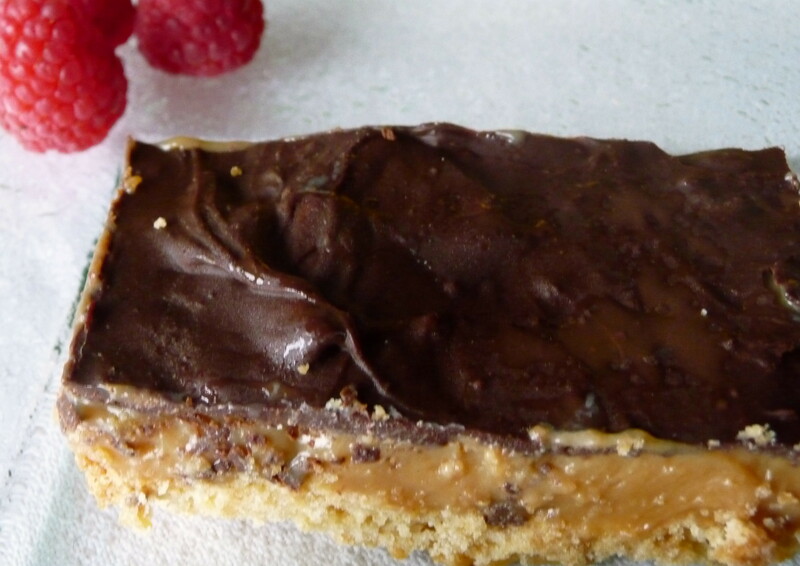 I had never heard of Millionaire’s Shortbread, but it looks fabulous! Thanks for sharing the recipe. Oh, and thanks for the introduction to Jackie Lee. I loved her video and will definitely be voting for her! Those shortbread biscuits are drool-worthy. They (the ingredients) remind me of a caramel Twix bar. I have a recipe for homemade ones and they pretty similar to your except for the cornflour. I never have any luck using the microwave when it comes to tempering chocolate and I melt it at the lowest temperature. I just temper the long way to avoid any wastage. Better safe than sorry. Love the 2nd photo, btw. Nice composition! Welcome back, Dan. The shortbread looks amazing. I’ve always wanted to try making dulce de leche that way but I was afraid the cans would explode. Too bad about the chocolate – a tiny bit of moisture must have crept in somehow – that’s so frustrating. Jaw. Dropping. Those pictures are amazing, Dan! (The ones of the trip and of the food.) I’d be very content to curl up here with a piece of millionaire’s shortbread and a cup of tea, and hear more stories from your trip. These two tasties look super delicious – I actually learnt the whole chocolate-in-the-microwave lesson a while back and so now only ever do it over a pot of boiling water on the hob. I do, however, still melt butter in the microwave. You’re right, by the way, a little chocolate would do me wonders… I’ll have to make some of this right away! Glad you’re back safe and sound, my only regret is that we weren’t able to get together whilst you were on my side of the pond! All to be remedied very soon, however, with my trip to yours. Thanks again, lovely! Thanks, Jax. I find that my most common microwave usage is for melting chocolate or softening/melting butter, but I finally remembered that I decided to try “sterilizing” a damp kitchen rag on full-power for two minutes (the same day as my shortbread prep). The remaining condensation would have made the chocolate seize up. I do look forward to our visit, when you make it over the Atlantic all the way to the Pacific coast! Hm. Where to start. Obviously, these look scrumptious for any millionaire or non millionaire alike. I have never heard of boiling condensed milk in the can and wow, what a cool thing if it is as easy as you say, which i don’t believe you are a liar so thumbs up for easy and cool. Beautiful photos, but they made me so jealous. Sigh. I have traveled as far as San Francisco this year and I simply live in the L.A. area. We can’t all be jet-setting foodies now can we? Thanks for the new post. Have missed them! Hi, Geni. I appreciate your sweet comments (I guess sugar isn’t restricted just to baking in your house!). The dulce de leche or cajeta (as it’s sometimes known in Mexico) in Latin American cuisines often use this technique. It does seem a bit scary, however, so I understand some people’s hesitation. No, I’m not lying – it works!! Living in L.A., with beach weather almost year-round and visiting SF aren’t so bad now, are they? 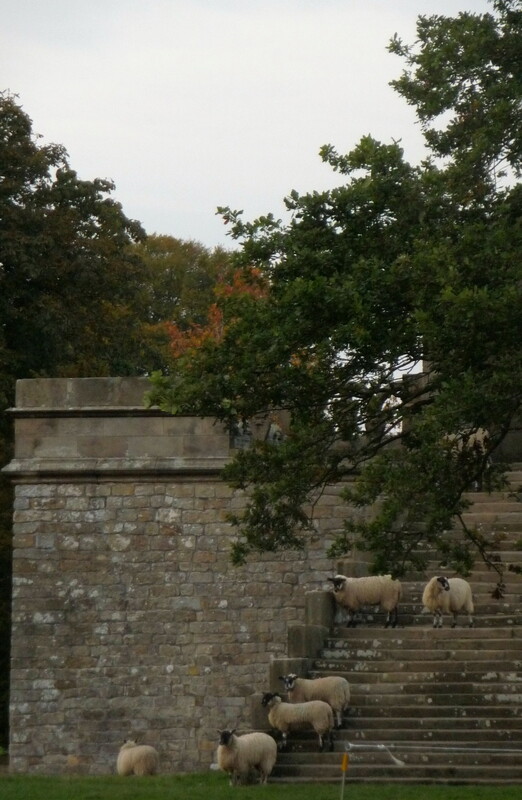 But I guess Scottish castles do seem a bit more exotic than the Santa Monica pier…. 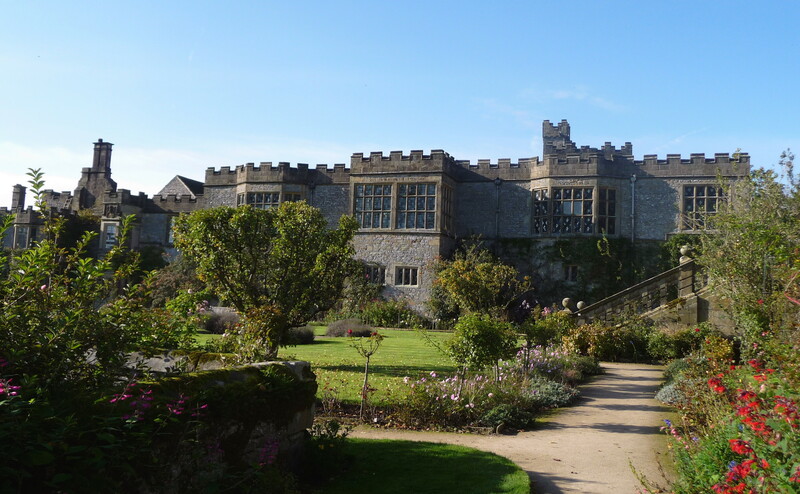 Oh to be nibbling on some millionaire shortbread while meandering the pristine grounds of Haddon Hall. If I can’t do both, at least I can recreate these yummy sounding treats. I loved my visit to Scotland and salmon is the first food I associate with it, but I have to say, this has its sweet rewards.